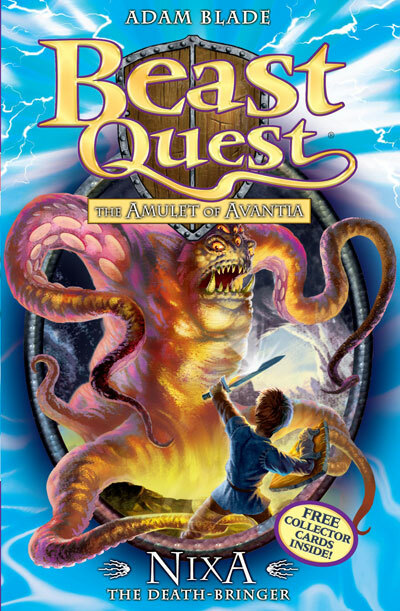 The first book in the fourth series of the exciting adventure stories that are as gripping as a computer game! Great for boys, with a huge collectability factor bolstered by the collectors' cards in the back of the books, and links to an excellent interactive website. Taladon the Swift has returned! But to Tom's horror, his father is a ghost. To save Taladon, Tom must battle the Ghost Beasts and collect the pieces of the shattered Amulet of Avantia. First is Nixa the Death-Bringer -- will her deadly disguises lure Tom to his death? Adam Blade is a pseudonym used by a team of writers.